TM Italia in London for a prestigious housing project, with a kitchen with a customised island. 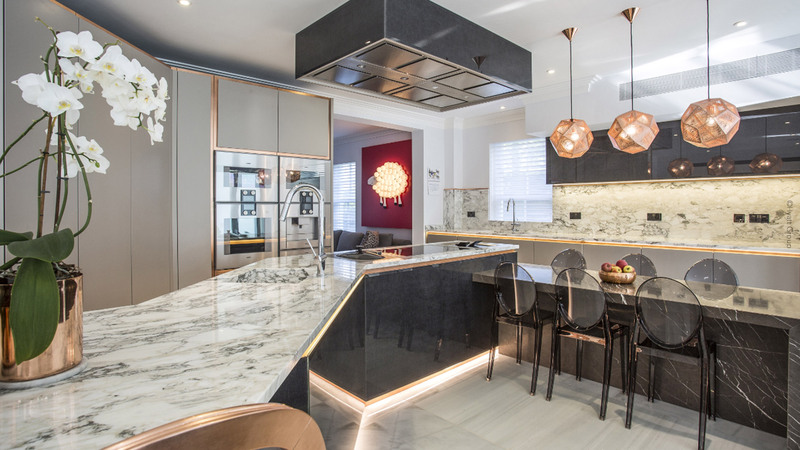 In a newly built villa in the heart of London, TM Italia has expressed the best of its craftsmanship by custom building a kitchen that combines the modernity of minimal furniture and the quality of traditional materials such as marble and copper. 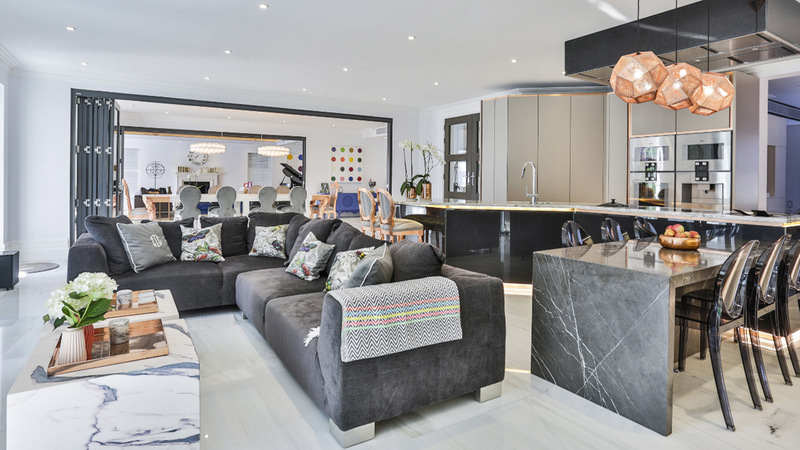 Visible from the living and dining rooms, the kitchen had to meet the well-defined stylistic requirements of the client in terms of forms, materials and colours. 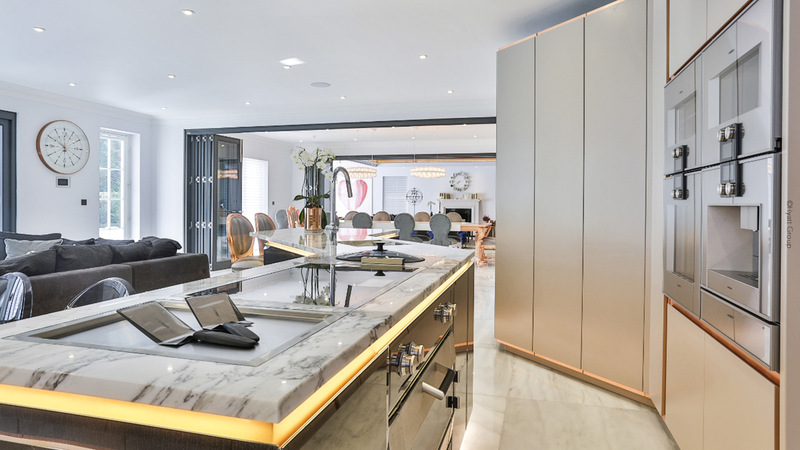 White marble was used for the benchtop and anti-splash wall, Corinthian stone for the breakfast table, glass surfaces with rear textile inserts for the sides and doors of the island bench, and light grey opaque lacquered surfaces for the doors and sides of the high cabinets. From a top view, the island bench, with built-in sink, stovetop, teppanyaki grill, and recessed steam cooker forms an open “Z” shape. 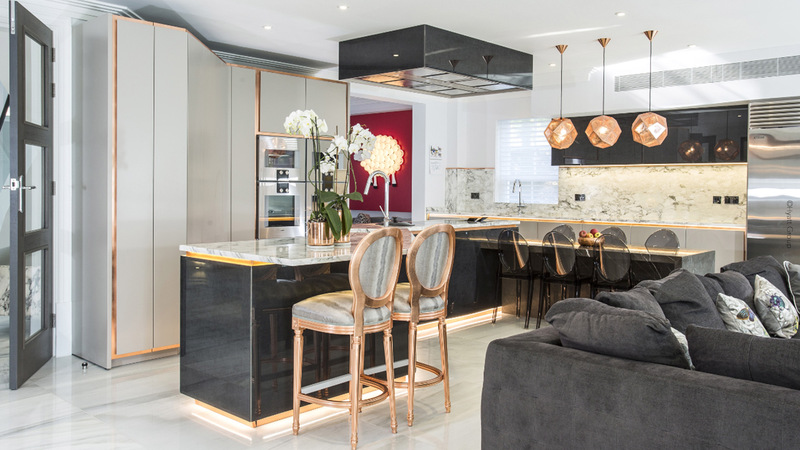 There are two eating areas: a high counter integrated into the benchtop with two copper stools and a table of normal height to seat six people. 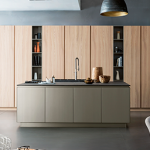 The wall cabinet system runs parallel to the island and is richly fitted with electrical appliances, ranging from a conventional oven to a steam oven, a coffee machine and a wine cooler. 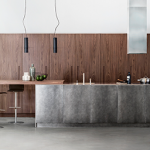 The glass-covered stainless steel finish picks up on the steel of the appliances built into the benchtop, as well as the refrigerator and freezer cabinet. The doors were built based on the T45 concept and have been completely customized. The system consists of the pairing of a double door: one lower D90 with a copper sheet finish and a lacquered upper T45, tapered to 45° on 4 sides to allow grip. The copper sheet of the underlying door creates a stylish metallic passe-partout that surrounds all the vertical surfaces with light. On the island, this detail is enhanced by the integration of an LED system.